Starting next week Monday, May 26th, I'll be hosting a new weekly challenge here at Timothy Moms. I'm calling it the Timothy Moms Deuteronomy 6:6-7 Challenge. 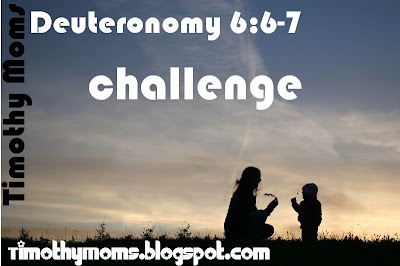 Each week you'll find a goal to challenge us moms to simply do what Deuteronomy 6:6-7 says: hide God's word in our hearts and then talk of His word with our kids in all our sitting, walking, driving, going, coming, at bedtime and when we wake up. I have a dear friend who loves the Lord, but feels very overwhelmed by the idea that she should teach her kids God's word. She wants to, she knows she should, but she feels like she doesn't have the time to research and plan out a "teaching" for her kids. I don't think she's alone. I think like my friend, many of us ( I know I have) fall into the trap of thinking teaching our kids God's word has to be some formal lesson plan...like Sunday school. But that's not what Jesus' heart is for us as parents. He simply wants us to hide His word in our OWN hearts, apply it to our OWN lives, and then talk of His word to our kids all day long. The challenges will be simple and applicable to daily life with kids. Be sure to post a link to the cooresponding Challenge post. For example, if you join in the challenge when I'm posting week #5, feel free to either jump right in at challenge #5 or go back to challenge #1, or any of the previously posted challenges and apply it to your life. Then at some point, blog about it and post your link on the Mr. Linky of the challenge # you participated in. And be sure to leave a comment so I know you stopped by (comments get sent to my email). I know the Lord will encourage our hearts and guard our kids' hearts as we obey Him in simply talking with our kids about Him all day long. I love this as it is so very important to teach our children about the Lord. I think there is so much we can teach them just as we go about our daily lives. Thanks for being such a strong voice out there in regards to teaching our children. My children and I have recently began reading Proverbs, and have memorized two verses along the way. It's a slow start, but I'm sure God will help us grow as we go. Thanks ladies for stopping and leaving your comments. I've been unable to get online all day today- my modem broke! Be sure to come back Next Monday the 26th and link up with Mr. Linky for the Deut.6:6-7 challenge! Oh, how I Love this idea!!! Thank you for throwing out the challenge to raise up Godly children in an unGodly world. I know that I did not start when this got started so I might be on my own but that is okay!